SPERI’s new partnership with the All-Party Parliamentary Group on Inclusive Growth was launched last night (February 21st) with a highly successful first event in Parliament. 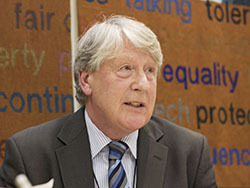 Professor Tony Payne, SPERI’s Co-Director, was part of a panel of leading UK and international policymakers and thinkers who came together to discuss the state of the debate on inclusive growth. The line-up of panellists also included Gabriela Ramos, OECD Chief of Staff, Sherpa to the G20 and coordinator of the OECD Inclusive Growth Initiative; Rick Samans, Head of the Centre for the Global Agenda and Member of the Managing Board at the World Economic Forum; Charlotte Alldritt, Director of the RSA Inclusive Growth Commission and Michael Jacobs, Director of the IPPR Commission on Economic Justice. 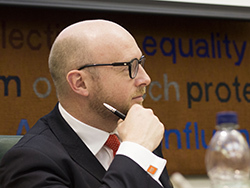 Liam Byrne MP, Chair of the APPG on Inclusive Growth, chaired the debate and oversaw a Q&A session involving the audience which was comprised of parliamentarians, researchers and members of the public. Liam and Tony outlined the shared aims of SPERI and the APPG which form the foundation of our new partnership (find out more here) before Tony presented his views on the inclusive growth debate. Tony argued that to secure inclusive economic growth will entail much more than just tinkering with the old ‘exclusive growth’ model. It demands that a brand new model of capitalism must be built both in Britain and internationally. He also set out the need for the debate on inclusive growth to draw on and be informed by new academic research. 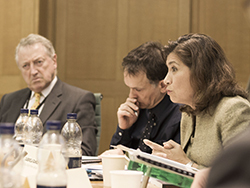 Through our new partnership with the APPG SPERI will be organising a programme of Events|News in Parliament and publishing new research papers. This week the APPG published ‘The State of the Debate 2017’ a series of essays that begins to set out the foundations for a new consensus in political economy around inclusive growth. Our Co-Director Professor Colin Hay and Dr Hannah Lambie-Mumford, research fellow at SPERI, are amongst 10 contributors to the report which also includes essays by cross-party parliamentarians, academics and international policymakers. Download the report here. The next joint APPG/SPERI event ‘Corporation Tax: A Global Race to the Bottom?’ takes place on Tuesday March 14th in the Wilson Room in Parliament. The event, also co-organised with Oxfam, will assess whether corporate tax cuts in the developed world are triggering a race to the bottom on corporation tax cuts in the developing world. Book your place here.